Most of us consider Fat as a culprit responsible for most of the diseases. But what we miss while making this misconception is that we can't live without fat. A healthy man must have body fat equivalent to 15% of body weight. What does it prove ? Is fat a healthy thing ? The answer is Balance. Anything out of proportion in our body can cause disease. So Balance is the key. Fat is a good thing till it remains in the correct proportion. But when it is stored in excess in our body then it becomes a disease itself. Note: American Medical Association declared Obesity as a disease in 2013. Obesity fits the classification of a disease as it reduces the life expectancy and disturbs the normal functioning of the body. Do you know a healthy women should have 27% body fat while men should have just 15%. If you want to know why then Read More. Fat affects our body in both positive and negative ways. Positive things about fat is that it is necessary for proper metabolism of body. Fatty acids are necessary for absorption of some vitamins from our diet. Fat acts as an insulation and shock absorbing element. Protein in our diet can't be utilized in absence of fat. If you want to know more about goodness of fat then read more. When it comes to negative effects of fat then blood pressure and diabetes are the very first thing that comes in our mind. Excess fat in our body can easily make us sick by increasing the cholesterol. Most of us don't know that fat has the ability to secrete hormones which can interfere with our regular hormones and make us sick due to hormonal imbalance. Our body has got two types of fat: visceral fat and subcutaneous fat. Subcutaneous fat is located just under the skin while Visceral fat surrounds our internal organs and it is much harmful then the previous one. To know more about these fats and their affect on body, read visceral fat vs subcutaneous fat. Inactivity and improper diet is the key to excess fat in the body. Apart from the normal fat in diet, transfat is the main culprit. Most of the fast foods contain transfat to increase their shelf life,but it decreases the life span of humans due to it disease causing ability. Transfats are formed by converting unsaturated fat into saturated fat through a process called hydrogenation. To know more about hydrogenation and transfat read more. Transfat increases the bad cholesterol level in body ad some experts believe than transfat can also cause cancer. The best way to measure your body fat or obesity level in the BMI chart which is calculated using your height and weight. Your BMIU can easily tell your either you are Obese or not. 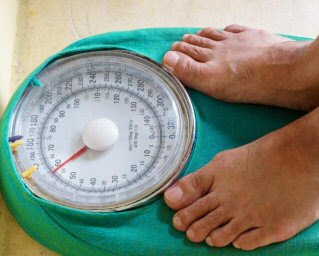 Calculate your BMI using our BMI calculator. Fat is good unless it is making you obese. So have a healthy diet plan with good lifestyle and stay away from diseases caused by fat.